I think it’s fair to say that I have a few “life-quest for the very best of” kinda recipes. The list includes: creme brulee, banana bread, brownies, veggie burgers, baguette, and yes, Chocolate Chip Cookies. In my lifetime, I have tried out many, many recipes, and, up until lately this one was my favorite. 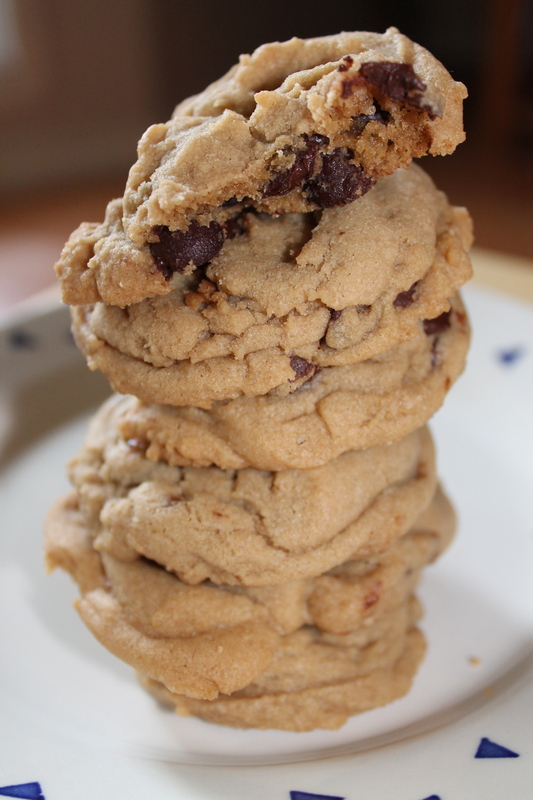 My main issue with Chocolate Chip Cookies is that I like them soft and chewy. And they usually are when you take them out of the oven, but the next day, they wind up crispy, and I don’t like that. These were still luscious and soft the next day. I don’t know if I’ve found the holy grail of Chocolate Chip Cookie recipes, but I am certainly one step closer. I think it might be the addition of cornstarch that makes them soooo good. Whatever. Just trust me. Try them. With a hand-held mixer or a stand-mixer, cream the butter together with the sugars. Add the egg, and mix well. Add in the vanilla extract. Slowly add in the flour, cornstarch, baking soda and salt, until it is all combined. Drop by spoonfuls (I used my handy-dandy cookie scoop) onto a cookie sheet, and bake in a 350 degree oven for 8-10 minutes. They really are much better if you slightly undercook them, as it makes the centers even more gooey. Cool and enjoy. But there will likely not be many left over for your freezer. UPDATE: We’re having a heatwave (a tropical heatwave! ), and it’s too hot to turn the oven on. I made a big ‘ol batch of these, and then froze them on cookie sheets in balls, raw, on parchment. After they were frozen, I peeled them off the parchment and put them into ziploc bags. You can take out and bake as many or as few as you need. Works really well! I’m up to the challenge. John like chocolate chips, as do I. As does everyone. I have to say, though, that I have a killer orange chocolate drop cookie recipe. Except it’s in storage for a few more weeks.